It was a rough night. She wasn't able to pull through. She was overcome from the thought of eating another cup of lime jello. Ok. Actually this is in the recovery room. 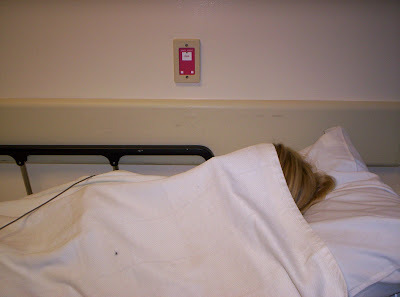 Charity always has her camera with her, and surgeries are no exception. She has some other pictures and experiences to share, and I want to let her do that when she is feeling better, but in the meantime, here are a few to enjoy. Charity showing her true poise in any situation. This picture is my fault. The one pic I captured on the ride home. She really wasn't feeling well at all, so I wasn't much in the picture taking mood.